National Science Foundation under Grant No. 0000629. §0. Since 1985, the California Museum of Ancient Art, Los Angeles (Director: Jerome Berman), has added to its collection of Babylonian antiquities a number of Ur III documents, of which one was edited by Daniel Foxvog in 1986 (“A Summary of Non-Sealed Labor Assignments from Umma,” ASJ 8, pp. 59-69). Fifteen of the remaining sixteen texts (excluding for a fuller philological treatment by M. Widell in this journal the text CMAA 015-C0019 documenting a legal proceeding) are offered below with short commentaries and computer-assisted tablet copies. For image documentation, references are made within the individual entries to the texts’ corresponding pages within the data set of the CDLI. The catalogue entries below consist of text numbers, dates (regnal year / month / day), provenience, and measurements height x width x thickness, in millimeters. Numbers 1-13 were a gift of Dr. and Mrs. Julius Winer, number 14 is a loan by Russ Kino, and no. 15 a gift of Russ and Ivonne Kino. Shulgi 47 / 00 / 25, from Drehem ? 3) mu-us2-sa ki-maški ba-ḫul 3) Year after: “Kimash was destroyed”. §1a. Although the text seems to be a common Drehem record of animals booked out of the accounts of officials, for which compare PDT 2, 958 i 17, 1026 rev. 2, 1273 obv. 10, Turin Drehem 399 obv. 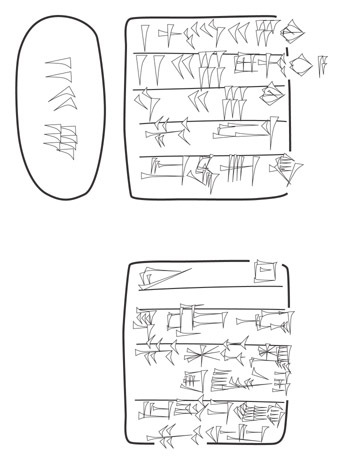 4, all with the official Ur-Enlila in parallel context, there are also Umma parallels (UTI 3, 2055; UTI 3, 2285 obv. ii 9 (there qualified as a gudu4)). To the official Ur-Enlila in Umma see OrNS 47-49, 268 4: nam-ša3-tam ur-den2- lil2-la2 (his “official” seal reads in the same text ur-den2-lil2-la 2 / dub-sar / dumu lugal-ku3-ga-[ni]; see also MVN 16, 1066 and UTI 3, 1775). Note also Nik 2, 466 obv. 3: ur-d en2-lil2-la2 dub-sar maḫ (Drehem); MVN 7, 581 4: kurušda (Girsu). 3) mu damar-dsuen-ke4 ur-bi2-lumki mu-ḫul 3) year: “Amar-Suen destroyed Urbilum”. §2a. Lu-dingira son of Ir-ḫula is not seldom found in the Drehem archives, cp. PDT 2, 767 rev. iv 12 describing irregularities in the deliveries of animals by both Lu-dingira and Shulgi-ayamu. 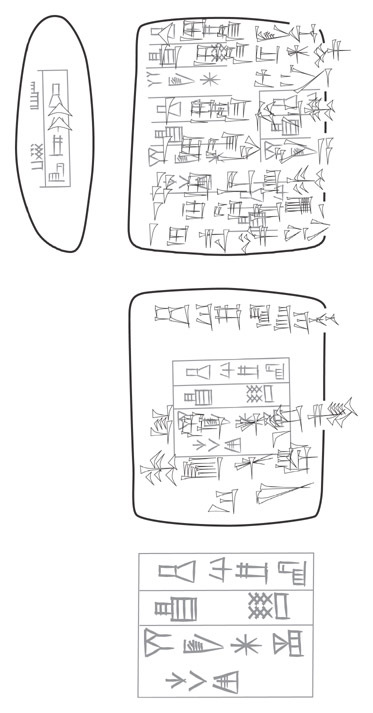 Both men receive animals from Abbasaga and Nasa in Drehem; see M. Hilgert, OIP 115, 17, and OIP 121, nos. 480-495 (in press). The dating formula iti u4 n ba-zal / iti month name is with ca. 500 attestations common in the Ur III administrative text corpus from Drehem. C. Wilcke drew attention in M. deJong Ellis, ed., Nippur at the Centennial. Papers Read at the 35e Rencontre Assyriologique Internationale, Philadelphia, 1988 (=Occasional Publications of the Samuel Noah Kramer Fund 14; Philadelphia 1992) 314 n. 10 to the occurrence in TRU 81 rev. 4 and BIN 3, 403 rev. 6 of the variant month name iti šaḫ2-ze2-da-gu7 (and note iti šaḫ2-ku3-gu7 in the so-called “treasury” archive from Drehem, for instance in the texts OIP 115, 466,TCL 2, 5481 and SAT 2, 516, ŠEŠ-ku3-gu7 in the Umma text MVN 14, 348; cp. W. Sallaberger, Der Kultische Kalender der Ur III-Zeit I [Berlin 1993] 8 and 195, OBO 166/3, p. 235, n. 319, and M. Civil in G. Pettinato, MEE 3, 276, note to line 12). P. Steinkeller at the 1993 meeting of the Sumerian Agriculture Group therefore proposed a reading iti zaḫx(ŠEŠ)-da-gu7 of our month name, the second in a Drehem/Ur string of three “animal-roast” month names (the other two animals being the gazelle maš-da3 and the u5-bi2 bird). 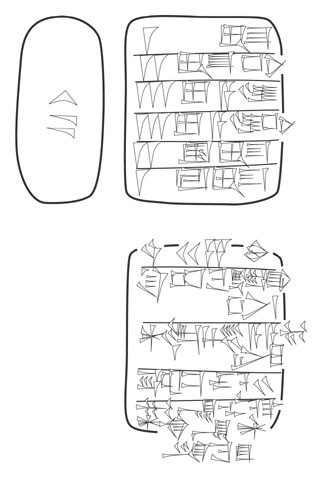 He would transliterate the variant form iti zaḫdax(ŠAḪ2)ze-da-gu7 and, based above all on the notorious Ur III pig husbandry accounting pair PDT 2, 1049, and MVN 15, 64 (and note CTMMA 1, 15, obv. 1-2 with 1 ud5 / ga-bi ze2-da šaḫ2 gu7-de3, “1 jenny goat to suckle the zeda pig”), with their reference to ze2-da pigs receiving either just 1/3 sila3, or no barley as daily rations, translate “month ‘suckling pig meal’ ”. 3) u4 26-kam 3) 26th day. 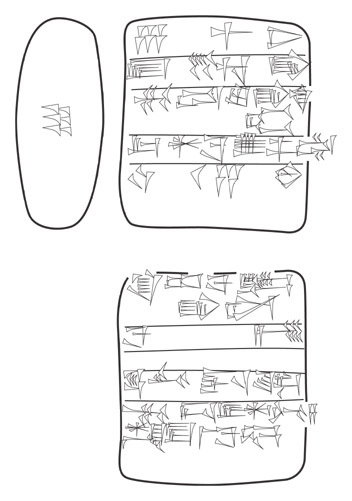 ur-bi2-lumki mu-ḫul 4) year: “Amar-Suen destroyed Urbilum”. 5) u4 15-kam 5) 15th day. 5) mu-us2-sa dgu-za den-lil2-la2 ba-dim2 5) year after: “Divine chair of Enlil was fashioned”. §4a. W. Sallaberger, citing Jacobsen, Foster and Sigrist (particularly his Drehem pp. 158-162), in OLZ 91 (1996) 405 stated that the e2 uz-ga is not a fattening shed as usually believed. Sigrist surveyed the Ur III attestations of this establishment and concluded that it was probably a residence of some importance at Drehem visited by high functionaries including the queen, but that it was within the administrative purview of the “cook”. Its close association with the e2 gu4-gaz, “slaughter house” and the e2 muḫaldim, “household of the cook”, in such texts as the Harvard Semitic Museum household accounts published by A. Uchitel in ASJ 18, 223-228, however, suggests that it may after all be connected to the processing of meat, possibly because of the amount of reeds being transported there connected to a type of “smoke house”. Cp. OrNS 47-49, nos. 23, 26, etc., and the extensive article Wu Yuhong, “The ewes without lambs and the lambs cooked in e2-uz-ga, “the private house of kings”, in the Drehem archives,” JAC 11 (1996) 65-109. 6) 1 sila4 gukkal 6) 1 fat-tailed lamb. 1) u4 25-kam 1) 25th day. 3) dšul-gi-a-a-mu i3-dab5 3) Shulgi-ayamu accepted. en dnanna ba-ḫun en-priestess of Nanna”. §5a. W. Heimpel has reviewed in BSA 7 (1993) 130-131 the textual evidence for the meaning of giš-du3, “mounting”, as a qualifier of small cattle, including and particularly gukkal. For the intercalary month iti ezen-mah min3 see W. Sallaberger, Kultischer Kalender 1, 8 n. 22 (with literature). 6) mu en-unu6-˹gal˺ dinanna ba-ḫun 6) year: “Enunugal(ana) of Inanna was installed”. 3) ˹gudu4˺ d[šakkan2] 3) gudu priest of [Shakkan]. §6a. J. Bauer, WO 13, 151, cites MSL 14, 49: 432 (proto-Ea), as evidence of a reading of /ešgar/ for MUNUS.AŠ2.GAR3, assuming an umlaut of /a/ to /e/ in this word (the “pronunciation” section of prEa shows eš(3)-gar; the reading /zeḫ/ was already shown to be incorrect in ZA 69, 208). To maš2 mu mu10aš2-gar3-še3 see OrNS 47-49, 76 obv. 1. The same seal of Lugal-engar is found in the Umma text OrNS 47-49, 149 (Lugal-engar-e); cp. OrNS 47-49, 138 obv. 4: (small cattle) giri3 lugal-engar dumu lu2-den-lil2-la2. 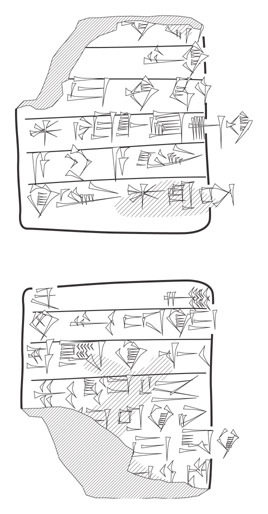 Line 1 of the seal legend ends in engar, with no room for a following -e. We should with W. Heimpel, BSA 7 (1993) 116, entertain the possibility that males are being substituted for the expected female kids, that is, that in specific contexts such as that of this text maš2 represents male kids and not “billy goats”. 1) ˹na-lu5˺ i3-dab5 1) Nalu accepted. 4) ˹mu˺ ḫu-uḫ2-nu-riki ba-hul 4) year: “Ḫuḫnuri was destroyed”. §7a. The phrase “attached to the ox” seems used exclusively to qualify fattened animals (instances of animals not additionally qualified with niga, “grain-fattened”, for example MVN 15, 193 obv. 2, 6, TIM 6, 8 obv. 1, 17, rev. 6, 8, and MVN 18, 376 [=AnOr 7, 376] obv. 4, record sacrificial animals otherwise qualified niga and so are no exception to this rule). 5) a-ru-a lugal 5) royal offerings. 2) ša3 uri5ki-ma 2) In Ur. ma-daki[-bi u3] ˹ḫu˺-uḫ2-[nu-riki ba-ḫul] and Ḫuḫnuri [were destroyed]”. §8a. This text belongs to the so-called “treasury” archive, for which see most recently W. Sallaberger, OBO 160/3, 240-252. 4) du11-ga i3-dab5 4) Duga accepted. 6) mu ma2 den-ki ba-dim2 6) year: “The boat of Enki was fashioned”. §9a. The Drehem tablets PDT 1, 404, AUCT 3, 127, 129, 139 etc., contain parallel accounts, regularly sealed by Ur-mes, recording the transfer from Taḫiš-atal of a number of animals to the official responsibility of Duga. Many more records, including MVN 13, 404, MVN 15, 276, PDT 1, 185, etc. (and see the following text), document the same movement of animals from Inta’ea. Both men regularly received (i3-dab5) animals from the Drehem official Abbasaga (Taḫiš-atal for instance in AUCT 1, 195, BIN 3, 167 and Iraq 41, 125 no. 4, Inta’ea in MVN 13, 449, 473, and AAICAB. 1, pl. 78, 1924-1788). Following BIN 3, 599 rev, 7, Duga appears to be an abbreviation of Duga-Baba. 2) du11-ga i3-dab5 2) Duga accepted. 4) mu ma2 dara3-abzu ba-ab-du8 4) year: “the boat ‘ibex of the abzu’ was caulked”. §10a. See the note to the previous, and the following text. 1) ab-ba-kal-la šu ba-ti 1) Abbakala received. 3) mu e2 dšara2 ba-du3 3) year: “The house of Shara was built”. 3) dumu lu2-dnin-gir2-su 3) son of Lu-Ningirsu. §11a. Abbakala is probably brother of the official Ur-kununa seen above (cp. MVN 15, 259, 261, etc. [more than a hundred occurences], in the extended seal legends of which the father Lu-Ningirsu is qualified as kurušda, “fattener” [late Shulgi and Amar-Suen seal impressions of the same official exhibit instead sipa na-kab-tum, “herder of the nakabtum”]). The same seal is found, for instance, on the texts MVN 15, 271, 272, PDT 2, 1043, 1044, 1045, 1046, and 1055. Such texts as the following one, and SAT 3, 1346, suggest that the receiving official Duga(-Baba) was as well a son of the same Lu-Ningirsu. 2) mu e2 dšara2 ummaki ba-du3 2) year: “the house of Shara in Umma was built”. 3) sipa na-kab-tum 3) herdsman of the Nakabtum. §12a. 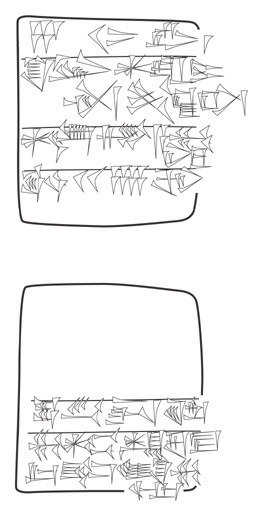 The scribe Duga often seals for his brother Urkununa (see the note to the preceding text and for instance AnOr 7, 47 [received from Urkununa! ], BCT 1, 61). 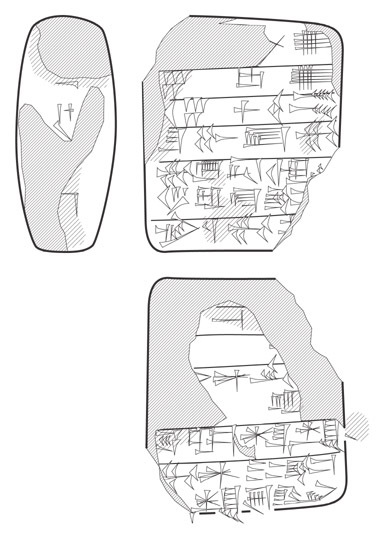 MVN 8, 216 (Shulgi 46), UDT 165 (Amar-Suen 2) and PDT 2, 949 (AS 5) demonstrate that Urkununa did use his own seal in the period before the reign of Shu-Sin. 5) mu aga3-us2 u3˹lu2˺ šuku-ra-ke4-ne[-še3] 5) in the name of the royal guard and prebend-holders. 6) ir11-mu ˹maškim˺ 6) Irmu was maškim. 1) [u4 n-kam] 1) [nth day]. 4) ˹giri3˺ d˹nanna˺-[ma-ba] dub-[sar| 4) Via: Nanna-[maba] the scribe. 6) ˹mu˺ di-bi2-dsuen lugal 6) year: “Ibbi-Sin is king”. §13a. Compare the parallel text Fs. Levine 132-138 (YBC 4190). 3) dingir-ra-ke4 šu ba-ti 3) Dingira received. 1) mu puzur4-˹da-gan ba-du3˺ 1) year: “Puzrish-Dagan was built”. 4) ir11-zu 4) your servant. §14a. 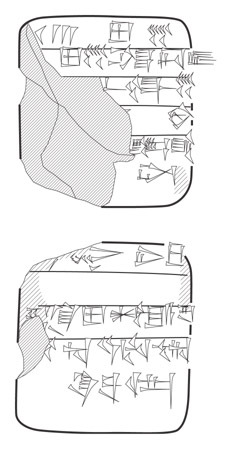 The transliteration follows the inscription of the text’s envelope (the tablet has not been removed from this covering). Lu-duga otherwise seals regularly for Dadaga, for instance on SACT 2, 97 (Shulgi 38), Aleppo 380, MVN 14, 66, Nik 2, 277 (Shulgi 39), Aleppo 382, 383, 384, Hirose 346, MVN 14, 50 (Shulgi 40), Aleppo 385, 386, 387, 388 (Shulgi 41), MVN 14, 10 (Shulgi 42). Note SACT 2, 117: dingir-ra-ke4 i3-dab5 a workman, sealed by Ur-Lisi; the Aleppo 13 (no year) seal has simply 1) lu2-du10-ga 2) dub-sar 3) dumu nigarx(NIGIN3)gar-ki-du10 4) gal5-la2-gal. Finally, A. Uchitel, Mycenaean 7 (=AAICAB 1, pl. 69-70, 1924-668) obv ii 9: 3 ama-gi-na dumu lu2-du10-ga dumu gal5-la2-gal; Or. 47-49, 500 rev. i 4: 1;0,1 nigarx(NIGIN3)gar-ki-du10 ugula gal5-la2-gal. 6) ša3 kab2-ku5 6) in “the reservoir”. 17) e zi-DU 17) ziDU ditch. 4) šu-murgu2-še3 4) to shu-murgu. 9) e sa-dur2-ra a-ga-an-du-ul 9) sadur and agandul ditch. 5) kin e ra-a 5) Work, canal “striking”. 6) a-ša3 en-du8-du 6) Endudu field. 7) mu bad3 mar-tu ba-du3 7) Year: “The Amorite wall was built”. §15a. The four-column labor account from the collection of the CMAA published by D. Foxvog in ASJ 8, 59-69, contains many of the same toponyms as this canal excavation text and thus doubtless derives from the same bureaucratic archive. These toponyms include giš-gu-la (probably a variant of giškiri6-gu-la) in obv. i 12 (workers assigned to fill the canal bank toward the “great woods (=orchard)”); en-du8-du in obv. ii 1 and 15 (latter reference to our kab2-ku5, “reservoir”); e e2-lugal in obv. ii 8. §15b. To the “great orchard” see AnOr 7, 186 obv. 2: GAN2 giškiri6-gu-la; AnOr 7, 282 obv. i. 7': giškiri6-gu-la. The kab2-ku5 doubtless refers to the kab2-ku5 en-du8-du, “reservoir of (the field) Endudu”, known for instance from the Umma texts MVN 15, 94 (=JCS 24,172 94) obv. ii 9, AAICAB 1, pl. 75, 1924-695 obv. 5, M. Civil, Georgica 2.03 (A 4270) 5, and JCS 39,125 13 rev. 6. §15d. The field a-ga-an-du-ul is known from other texts in association with other fields mentioned here, for instance in M. Civil, Georgica 2.03 with a-ša3 en-du8-du, and in SNAT 482 with giškiri6-gu-la. Although only known from two further texts (MVN 16, 912 rev. ii 1 and 961 rev. 4), the signification of kin e ra-a as a means of describing the excavation of canals seems straightforward. §15e. The group of fields (German: Flur) known in many Umma texts as EN.GABA.DU is in various publications transliterated en-gaba-du or en-gaba-ra2, without apparent evidence for one reading over the other. en-du8-du is also chosen as a conventional option.